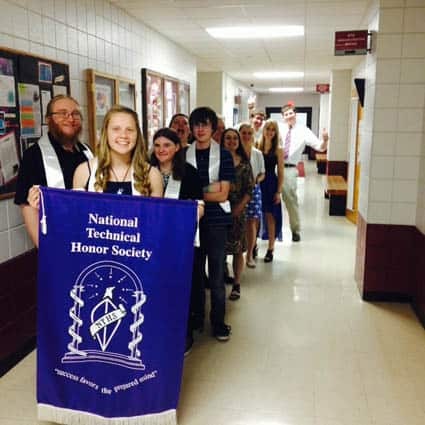 The 2015 inductees to the National Technical Honor Society march down the hall behind a banner. RUTLAND – On May 14, Stafford Technical Center inducted nine new student members into the National Technical Honor Society (NTHS). Inductees have achieved an overall grade of 88 percent or higher in each Stafford academic course, a grade of 90 percent or higher in their technical program, have one or more faculty and/or staff recommendation, and are actively involved in student government, civic, or social organizations. NTHS members should be good, honest, responsible student-citizens who have made a personal commitment to excellence, according to its mission. Stafford congratulates our inductees and their continued efforts to exemplify the seven attributes of membership: skill, honesty, service, responsibility, scholarship, citizenship, and leadership.